Removing tough algae from aluminum boat. This is an all aluminum bass boat. Looking at the photos, will this work? Is it acid based? Most guys I know would use a HF acid or like chemical. I was talking to Jim Cassidy earlier today and he told me about your challenge. Thanks for the pictures, they really help. It would also help if you could send me a wider angle shot of the boat, especially if you are going to detail the rest of the boat. The guys that use HF or HCL use these products because they don’t know what they are doing and in most cases they ruin the customer’s boat. These products will etch and dull the aluminum and discolor it. In some cases they will even eat holes in the metal. Algexis the right product for removing the algae and other marine growth. Spray it on (keep it wet) and let it work for about 20 to 30 minutes. Give it a scrub with a stiff brush and hose or pressure wash it off. From the pictures, it looks like there is some calcium along the waterline. You may have to re-apply the Algex to remove this as it is tough to remove. Algex is an acid based product containing several acids in different proportions, plus inhibitors and other ingredients. It is as tough as you can get, without damaging the aluminum. Algex is also safe to apply to the painted motor bracket and lower leg of the outboard. From the pictures, it looks like the aluminum is stained. The transom does not look as shiny as it could. I assume that after you get the growth off that the hull will also be stained. You can restore this with Aurora Marine Grade Alumabrite. It’s a spray on rinse off formula that will brighten the aluminum. It’s made especially for aluminum alloys used on boats. 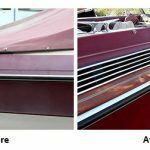 If the customer wants, you can apply two coats of VS721 on the aluminum hull to reduce the attachment of marine growth in the future and to protect the shiny appearance to keep the boat looking new. It makes the bottom much easier to clean. Algae usually just wipes off with a sponge. You can also apply it to the outboard. In addition it will reduce the drag on the bottom and give him better performance and reduce fuel consumption. His boat got tagged because the EPA is nervous about the spread of invasive species. They are desperately trying to prevent Zebra Mussels and Quagga Mussels from entering the local waterways. These mussels can’t stick to VS721 so it really helps. 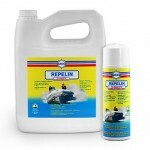 If you need more information on boat detailing go to www.auroramarineclub.com – Ask the Skipper.